Why it's the best: The twist on the inside of the Twisted Tornado Crimp® grabs onto the wire like little figures to ensure the strongest hold. The twist on the outside adds a design element to your jewelry. 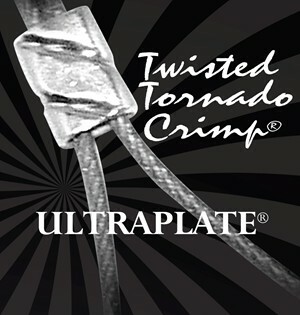 The Twisted Tornado Crimp® ULTRAPLATE® is extremely easy to use. You don’t need a special crimping tool. All you need is your tapered end (chain nose) pliers. How to use: Cut the tip of your stringing wire at an angle. Then thread the stringing wire (up to size .019 wire) through the crimp and loop it back through. The crimp is designed to fit your beading wire snuggly for optimal hold. Sizing: Use the .019 size for beading wire up to and icluding .019 size wire. When utilizing .024 size wire, use our .024 Twisted Tornado Crimp® ULTRAPLATE®. It is uniquely designed for .024 wire only. Finishes: Available in 6 UltraPlate® finishes. Use with our Synergy Beading Wire® for the perfect finish!